I Baked a Pie! | Live. Learn. Love. Eat. Today I decided it was a good day to bake the pie that I have been dreaming about for the past few weeks. It is a very cold, gloomy day here, so we spent most of the day inside. We tried to go out for a walk, but it started raining on us. The girls really enjoyed helping peel and taste test the apples and now the whole house smells of sweet cinnamon. 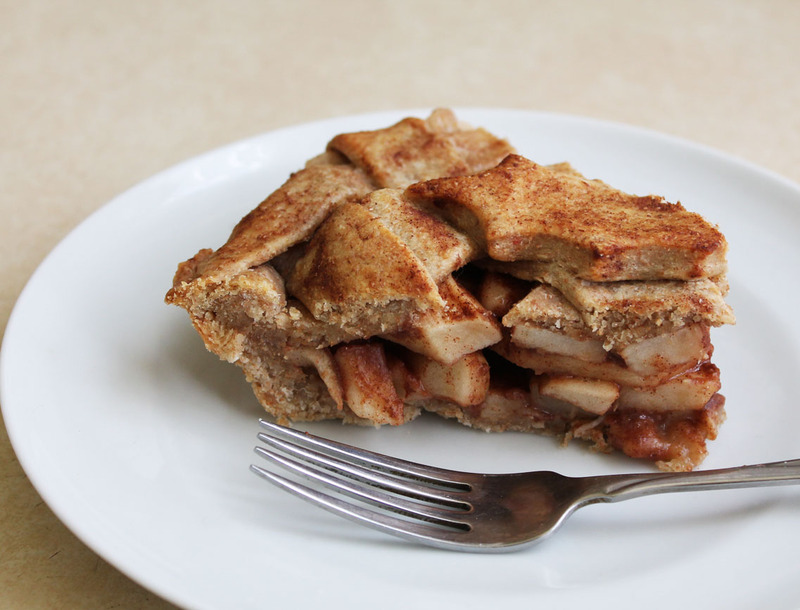 A delicious homemade cinnamon apple pie on a flaky, healthy, whole wheat pie crust! Combine the flour and sea salt in a medium mixing bowl. Cut the margarine into the flour mixture, until crumbly. Add the cold water a little bit at a time and mix until combined. You may have to use your hands to help the dough along. Wrap and refrigerate the dough for at least 45 minutes. Meanwhile, you can begin to prepare the apple filling. Place the peeled and sliced apples into a medium mixing bowl. Add the cinnamon, flour and maple syrup and toss until each apple slice is coated. Once the pie crust has finished chilling in the fridge, divide it into two equal sections. 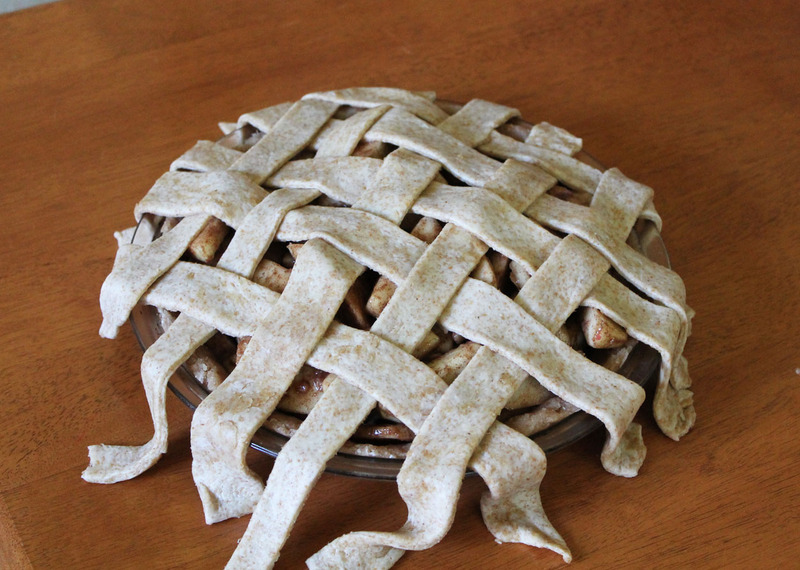 Roll out one section of the pie dough into a large (9 inch) circle and press down evenly into a glass pie pan. 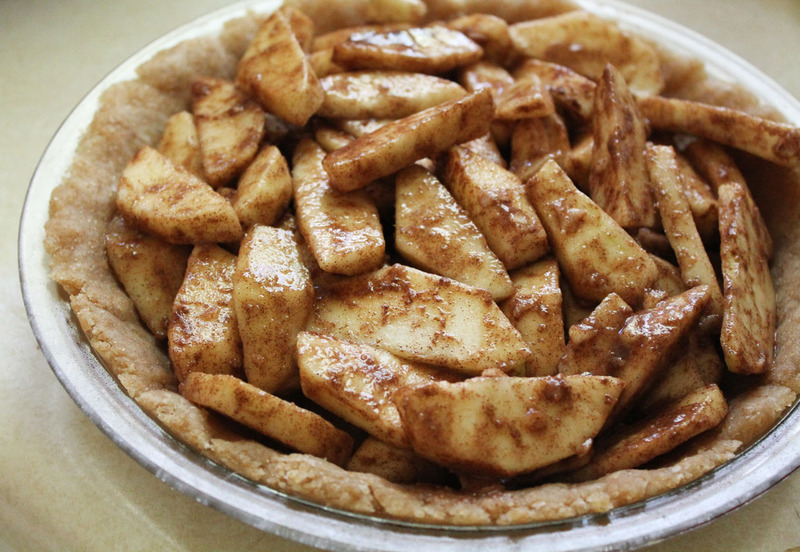 Place the apple cinnamon filling inside the crust. Roll the second section of the pie dough into a large (roughly 10 inch) round circle. You can either place this circle of pie dough on top, tuck in or crimp the edges and slice a few slits in the top of it, or you can create a lattice design on top of the pie. To make the lattice top, cut the dough with a pizza cutter into 10 equal 3/4 inch wide strips. 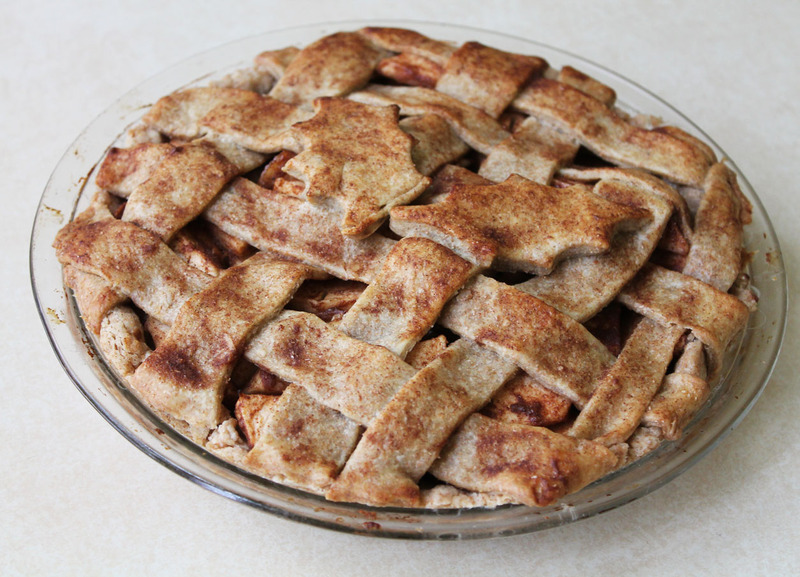 Check out the video tutorial here to make the lattice top pie crust if you don’t quite know how. I am glad that I decided to do this design because it looks so pretty! We also added two leaves cut out from the excess pie dough and placed them on top of the lattice top. I used the leftover maple syrup/cinnamon mixture that was left in the bottom of the mixing bowl to brush on top of the pie. This is optional, but very yummy! Bake the pie at 425°F for 10 minutes. Reduce the heat to 350°F and continue to bake the pie 30-35 minutes more, until the top is golden and the apples are soft. Yum!! Thanks for sharing. Enjoy your weekend. 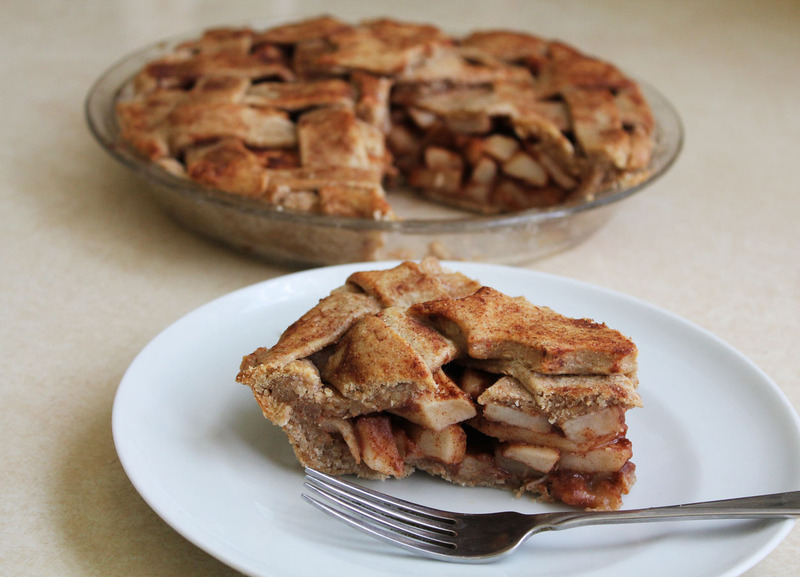 I think you’ve read my mind … I’ve been in search of a vegan pie crust. 🙂 Now if we could just make it fat-free. LOL! This pie is absolutely awesome!!! I made it yesterday for my omnivorous hubby and his Canadian friend (whooo-hooo for maple syrup) and they loved it. Thank you so much for sharing this wonderful recipe! 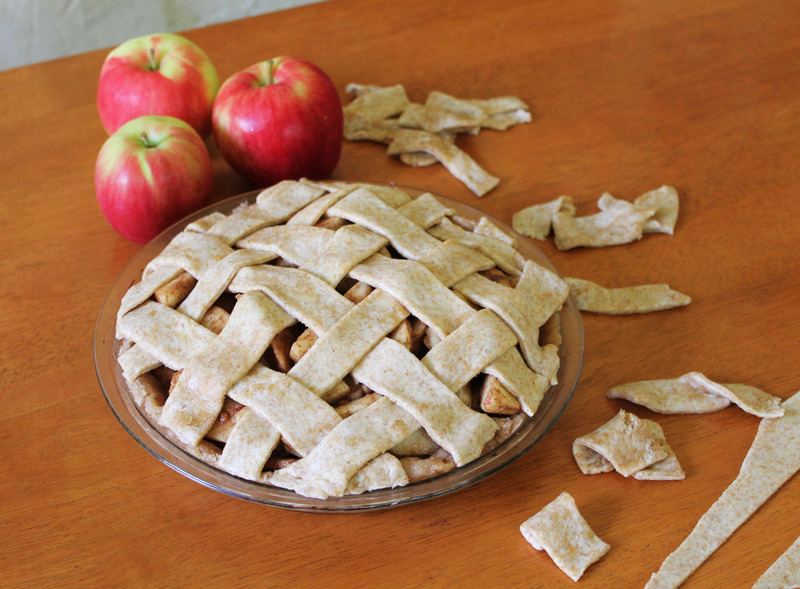 I’ll make that pie many times…and yes, the pie crust: simply great!